Axon Group, Almeco and PCA will be exhibiting at several fairs this year. Of course you are more than welcome to visit us. Find out which fair suits you best here. SEPEM Industries offers practical solutions to all manufacturers in the Douai region, regardless of their sector or activities. Almeco will be there to represent our business unit industrial fans. To guarantee the most efficient solution for your project, Almeco relies on a wide range of fans and blowers: from small axial and centrifugal fans for standard applications to large custom ventilators for applications in the most demanding environments. >>> Register here for free as a visitor! CFIA has been the most important food processing event in France for more than 20 years. It brings together 1500 exhibitors, each with their own solutions for packaging processes and more. We will be present with Almeco to introduce our drying solutions. During the production process you often have to dry, cool or blow off your products before you can pack, move or print them. We can help! The technical solutions of our own RONAIR range in combination with existing ACI systems ensure that drops of water are removed from packaging materials in the most efficient way. We combine the advantages of air knife and drying plate technology. We are back at Jobhappening in Kortrijk with all our job offers. Don't miss it if you are fascinated by technology! Maintenance and Worksafe join forces in 2019 and constitute the largest event in Belgium on production-oriented maintenance and the main meeting point for prevention consultants and facility managers. Our entire company will be represented at this show. Almeco is present with industrial fans, drying systems and cooling towers. And PCA will be available with water treatment, air purification and automation. Will you be graduating soon? Are you going to look for a suitable job at the graduation fair in Ghent? Then come by our booth so that we can get to know each other! On 3 & 4 April 2019 Empack will return to the Brabanthallen in s-Hertogenbosch to present all innovations in the field of packaging, packaging machines and label & print solutions to its target group. The focus of this 18th edition is on subjects such as food safety in combination with packaging, coding qualities, the digital transformation, the rise of robotics and making packaging processes more efficient. At the same time, the trade fairs Logistics & Distribution and Automation will also take place. Here too, Almeco presents our drying solutions. In many production processes, there is a crucial moment when you have to dry, cool or blow products before you can package, move or print them. We have the solution for this! Our RONAIR range, complemented by our ACI systems, ensures that drops of water are removed in the most efficient way from packaging materials. We combine the advantages of air knife and drying plate technology. 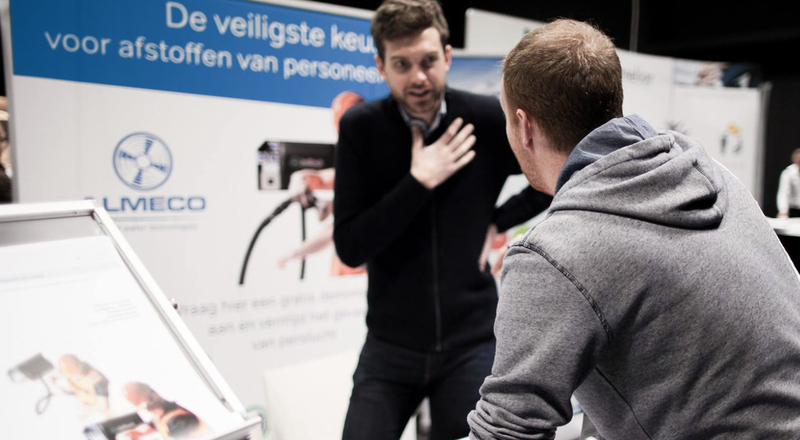 At the end of April, you can meet us at the employment event in Waregem! More information follows on a later date. Prenne is a trade fair on well-being at work. The focus is on prevention and safety. Almeco runs a booth to present our blow-off units. As an employer, you are familiar with the problem of personnel blowing off their clothes and skin with compressed air, which is very dangerous. We have a safe alternative: our JetBlack cleaning stations and Cleaning Booth! Fachpack is a renowned packaging fair in Germany. It was first organised in 1979 and has since grown into one of the most important packaging fairs in Europe. So not something we can afford to miss. We will be present with Almeco to introduce our drying solutions. In the course of the production process you often have to dry, cool or blow off your products before you can pack, move or print them. We can help you with this! The technical solutions of our own RONAIR® range in combination with existing ACI systems ensure that drops of water are removed from packaging materials in the most efficient way. We combine the advantages of air knife and drying plate technology. Solids is the best annual event for networking opportunities in the sector of granules, powder and dry bulk industrie in the Benelux. This year the event takes place in Rotterdam. Almeco will be there to represent our business unit Industrial Fans. To guarantee the most efficient solution for your project, Almeco offers on a wide range of fans and blowers: from small axial and centrifugal fans for standard applications to large custom ventilators for applications in the most demanding environments. Aquarama, the trade journal for water technology, organises an annual trade fair. In recent years, the number of visitors and exhibitors has increased. It is not only a moment to see your partners, suppliers and customers again, but also to make new contacts. PCA participates at this fair to present our water treatment solutions and air purification solutions. After all, we specialise in both process water treatment and waste water treatment and are eager to offer you a custom-made solution.